School supplies are precious commodities to the children. We take for granted a sheet of paper, a notebook, a pencil. In Honduras, these are treasured. When we play with the children, one of the activities they love is coloring in a color book. We actually tear a page from the book to give each child, and they take turns with the colors or markers, taking one at a time and conscientiously returning the borrowed one before taking another. Their spirit of sharing is remarkable. Whenever a team goes to Honduras, we usually carry with us donations of school supplies that come from our many loyal donors. If only everyone could see their faces light up when we hand out pencils, glue, scissors, crayons, pens, notebooks! Church groups often collect school supplies for us. Or social groups like bunco clubs or book clubs will go together. Cash donations are welcome, and you can write “school supplies” in the margin. When we started the Secondary Education Scholarship Program in 2003, students expressed their main goal for graduation from high school was to become a teacher in the primary schools. Anyone with a diploma from high school is qualified to teach in the primary schools, and it represents job security. We have observed such growth in our students over the years. Now when we talk to students about what they would like to do when they graduate, 70% of them express a desire to continue their education in a trade school or university. They speak of learning skills to become a mechanic or carpenter which requires further education in a trade school. They also speak openly of wanting to go to university and become a doctor, lawyer, nurse, engineer. There are agricultural colleges in Honduras that specialize in teaching how to grow crops and livestock in environmentally sustainable methods. Business colleges are available for students to learn about computers, accounting, and business management. Tuition at these schools is free, but costs for room and board, books, supplies, and transportation have to be paid. 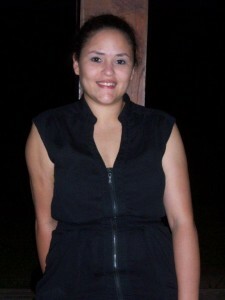 Ana Ortiz is a student at the University of Honduras majoring in foreign languages with a focus on English. Ana has served as a translator during our medical mission trips and is an excellent example of the benefits of a college education. The Education Program currently maintains a 97% high school graduation rate! These students would not have been able to accomplish this without the financial and program support we provide. The program began in 2003 with 17 students. In 2014 we have 155 students enrolled in the program. Our goal for 2015 is 175. The families enthusiastically support their children in the program. The $250 scholarship provided by Honduras Good Works does not cover all the costs. Parents are expected to contribute a portion. This ensures their commitment and support. We have observed a new and unexpected trend in the villages with our Education Program. Reverendo Dagoberto reports that teenage pregnancy is now the exception rather than the rule. There are criteria students must meet to enter and stay in the program. One of those is avoiding pregnancy. Parents at home help. They are now enforcing new standards of behavior for their children because they understand getting an education is their child’s best hope for a better future. As little as $250 can send a student to school for an entire year. Graduation from high school means these students can find good jobs to support their families. Some of our students are wanting to go on to college or a trade school. When we started taking medical missions to the rural villages of El Paraiso, we learned that the children from these remote areas don’t go to school beyond the sixth grade. By law, the government of Honduras provides a free education through the sixth grade. Beyond sixth grade, however, is considered a private education (called colegio in Honduras); and families must pay all costs– fees, books, supplies, uniforms, and transportation costs. For these villagers, that means education stops at the sixth grade for two reasons: there are no secondary schools in these tiny villages, and the families cannot afford to send their children to secondary school. Statistics worldwide have shown that people with only a sixth grade education are destined to a life of poverty because they will be denied jobs that require more education. Poverty, then, is perpetuated in these remote villages. Boys without a high school education typically join their fathers in the fields, migrate to the cities for low paying, unskilled labor jobs, or get into criminal activity or gangs. Some attempt illegal immigration to the United States. Girls stay at home and help with siblings until they start having babies of their own, often as young as 12-14 years of age. In 2003 we started our Secondary Education Scholarship Program raising enough money to send 17 students to school. We set up a program where we provided $160 per student to help cover the costs, requiring parents to contribute a portion as well. From the onset, we established that the Secondary Education Scholarship Program is not charity, nor is it free; and families are expected to make a financial and behavioral commitment to their children’s educations. Over time that amount has risen to $275 per student that covers about 60% of the annual cost. We also established criteria for recipients of the scholarship funds, under the supervision of our Honduran Education Coordinator, Reverendo Dagoberto Chacon. Students are required to commit a minimum amount of time daily to study, and they must pass each grade in order to stay in the program. Students are also expected to participate in community activities and projects. Behaviors are closely monitored . The Coordinator counsels the students not to get involved in serious boy-girl relationships until they graduate. Parents are expected to support their students’ participation in school and enforce study time outside of class. For these students to go to secondary school, they really have to want to go to school. Imagine, if you will. These students live high in the mountains. They must walk down the mountain, often fording creeks and rivers, to a meeting place where they join other students and ride in the back of a pickup truck. They ride to a highway where they catch a school bus that takes them to the town or city with their secondary school. When classes are over, they repeat this journey, meaning the commute is hours a day. For some, the school is so far away that they live away from their families during the week, returning home for the weekends. The scholarship team visits Honduras twice a year to check in with the students and their parents, and to reinforce the benefits of continuing in their education. They have been pleased to report a wonderful and startling thing. Part of the Honduran culture is to share everything. The families on their own decided to pay more out of pocket, so the scholarship funds could be stretched to reach more students. As a result of their sacrifice and sharing, additional students can go to school each year. We have some other impressive statistics. 97% of our students finish school, a graduation rate that matches any school system in our own country! We have also learned that in the villages with our education program, teenage pregnancy, once the norm, is now the exception rather than the rule. 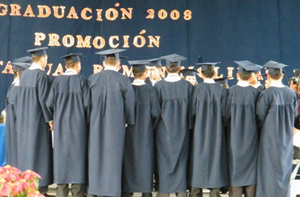 70% of our graduates express desires to continue their educations in a trade school or university. They speak of becoming doctors, nurses, lawyers, engineers. Back in 2003, our students would never dared dream this high. They have hope for a better future. It is heartbreaking for us to tell a family we do not have enough funds to send their boy or girl to school. Our dream is to say “YES” to any family needing our help. We work closely with the Episcopal Diocese of Honduras and Deanery of Yuscaran. Our Spiritual Adviser in-country is The Reverend Dagoberto Chacon, who also serves as our Honduras Education Coordinator. Reverendo Dagoberto, together with Reverenda Lourden del Carmen Herrera, work closely with the villages we serve. They know the families as well as the village teachers and community leaders. They and other leaders in each village carefully select students for enrollment in our Education Program. The child selected in a family for further education is frequently the one who earned the highest grades during the elementary education terms, and it is a painful selection process to watch as parents choose who among their children will and will not get this opportunity. The students are interviewed, and the selection team completes an assessment of each student considering the child’s ability to satisfy academic requirements as well as the student’s character and behavior. The Honduran team works closely with the U.S. Honduras Good Works Education Committee. However, we take our direction from the onsite Honduras team. 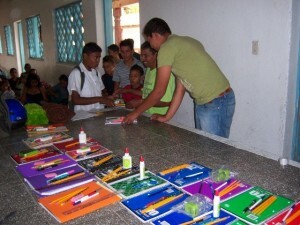 Honduras Good Works then provides the financial resources to cover the fees, transportation, books and uniforms for students enrolled in the school year. We know that the best way to make a lifelong difference for a rural Honduran youth is to make it possible for him or her to continue their education past the sixth grade.